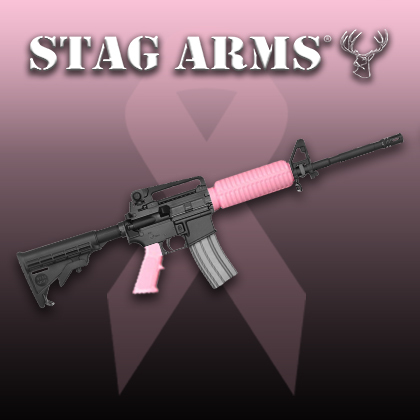 Stag Arms, one of the nation’s largest AR-15 manufacturers is working to raise funds and increase awareness for the National Breast Cancer Foundation through the end of October. In honor of Breast Cancer Awareness Month, Stag Arms will offer several of their most popular rifle models – Models 1, 1L, 2, 2L, 5, and 5L – as well as their upper halves - with carbine style thermoplastic pink handguards and pistol grips. “Many of our friends and families have been impacted by breast cancer and we want to support the National Breast Cancer Foundation in any way we can,” said Mark Malkowski, President of Stag Arms. The cost for the upgrade is $20.00 and will be installed onto the product(s) purchased. In the case of upper halves, the pistol grip will be included with the shipment for installation by the customer. All proceeds from the upgrade will be donated to the National Breast Cancer Foundation.